The Gaspee Days Committee at www.gaspee.COM is a civic-minded nonprofit organization that operates many community events in and around Pawtuxet Village, including the famous Gaspee Days Parade each June. These events are all designed to commemorate the burning of the hated British revenue schooner, HMS Gaspee, by Rhode Island patriots in 1772 as America's 'First Blow for Freedom'®. Our historical research center, the Gaspee Virtual Archives at www.gaspee.ORG , has presented these research notes as an attempt to gather further information on one who has been suspected in, or being associated with, the burning of the Gaspee. Please e-mail your comments or further questions to webmaster@gaspee.org. Edward Field, in his 1902 work, State of Rhode Island and Providence Plantations at the End of the Century: A History. Boston, Mason Publishing Co, Vol I, p464-468 presents a letter from Solomon Drowne, Jr of Providence to his brother William in Mendon, MA. Field points out that it was startling that some people self incriminated themselves by openly discussing the affair in the public mail. Providence, June ye 23rd, 1772. Doubtless you have heard of the skirmish down the river, and of the burning of the armed Schooner, and badly wounding the captain; so I shall write no more concerning the affair (though I was on the wharf when the boats were manned and armed and know the principal actors), lest it should be too much spread abroad; and perhaps you have seen the thundering proclamation in the newspaper, and the reward of £100 sterling offered to any person or persons who shall discover the perpetrators of the said villiany, as it is called. Left: Solomon Drowne, MD by Charles Cromwell Ingham (1796-1863), currently the original portrait is in John Hay Library 105 at Brown University. Solomon Drowne, Jr, MD was an eminent American physician, surgeon, and botonist during the 18th century. A good biography of this man can be found in Genealogy of that branch of the Russell family which comprises the descendants of John Russell of Woburn, Massachusetts, 1640-1878 by John Russell Bartlett, 1879 and which is available on-line in HeritageQuest through the NEHGS web site. There are also quite a few on-line biographical snippets, including one from Brown University. 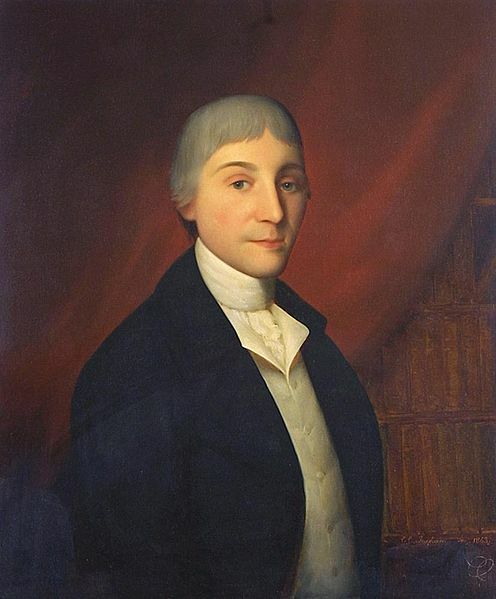 Solomon Drowne, Jr was born on 11 Mar 1753 to Solomon Drowne, Sr and his second wife, Mercy Tillinghast Drowne, (a cousin of Gaspee raider, Joseph Tillinghast). Solomon, Sr. was descended from a ship-building family, and he was a prominent Assistant in the RI Assembly, that is equivalent to a State Senator of today. The Drowne family was prominent in the First Baptist Church in Providence. According to the 1770 list of Providence taxpayers, Solomon Drowne, Sr. (1706-1780) was a landowner in Providence in the II B 4 area that housed many known Gaspee raiders. Solomon Drowne, Jr. would've been 19 years old at the time of the attack on the Gaspee. There were cousins, also named Solomon Drowne, born in 1746 and/or 1756 in the Warren/Bristol, RI area, so there is some potential confusion here. Solomon Drowne shows up extensively in internet searches owing to his lifelong habit of keeping journals and correspondence that described life during the Colonial, Revolutionary, and Federalist periods of the United States. References to these journals and letters show up sporadically in several different venues, and include journals describing a trip to Newport when he was 16, seeing the liberty tree for the first time, his experiences as a surgeon for the Revolutionary army in 1776 New York, and others. There was a brief article appearing in Rhode Island Medical Journal (now Medicine & Health Rhode Island) Goldowsky, SJ. RI Med J 1972 Sep 55(9):287. "Solomon Drowne and the Gaspee Affair - Premedical Student Views Historic Event". He published Lines to the Memory of Dr. Joseph Warren (1775). In 1780, Drowne sailed on one of Rhode Island's privateering ships and wrote about the event in Journal of a Cruise in the Fall of 1780 in the Private-Sloop-of-War, Hope. (Analectic Press, New York, 1872). He graduated Rhode Island College (now Brown University) as valedictorian in 1773 along with his lifelong friend and another Gaspee co-conspiritor, Theodore Foster. He completed his masters degree at Dartmouth College and his medical degree at College of Philadelphia (now University of Pennsylvania). Dr. Drowne served in the Army of the Revolution between 1776 and 1780 as a surgeon, was at the Battle of New York (1776) and Battle of Rhode Island (1778), and was entrusted by LaFayette and Rochambeau with the ongoing care for invalid French soldiers after their regiments had departed Rhode Island. He was discharged from the 1st Rhode Island Regiment in1783 and received a Badge of Merit for six years service. Some of his surgical instruments used in the Revolution are on display at Fort Ticonderoga. After the Revolution he practiced medicine in his native Providence, and in 1783 was appointed to the board of fellows for his alma mater, Rhode Island College (now Brown University), and served several years as Secretary for the Corporation of Brown University. In 1785 he toured medical schools in England, Holland, Belgium, and France, and dined with Benjamin Franklin and Thomas Jefferson. His younger brother, William Drowne, had been a fellow privateer, was a prisoner aboard the infamous British prison ship, Jersey, and died in 1786 from disease related to that time, despite the best efforts of Solomon (one suspects William died from tuberculosis). Sophia II (1786-1786) at age 4 months. In 1788, Solomon Drowne's name appears with others as having been appointed a Justice of the Peace for Providence, but shortly thereafter, he and several other families from Rhode Island (including Gaspee raid leader Abraham Whipple) moved to and helped found the settlement of Marietta, OH. In 1789 Dr. Solomon Drowne was invited to give a funeral eulogy to his patient, General James Varnum, and in 1789 delivered the keynote oration marking the first anniversary of the founding of Marietta. He participated with General St. Clair, and with Cornplanter and other chiefs in the Indian peace treaties at Fort Harmar in 1788/9. Drowne wrote in a letter to his wife back in Providence, "It afforded me great satisfaction to see their manner of doing business,--at the end of a speech presenting a String of Beads, or Belt of Wampum. I think there was more decorum observed than in the British Parliament, when I was there." He returned to Providence in 1792, but because of chronic health problems (perhaps tuberculosis) Drowne moved to Union, Pennsylvania and Morgantown, Virginia (now WV) at some point afterwards. He ended up retiring back to his native Rhode Island in 1801. In 1810, he served as a delegate to the convention that formed the National Pharmacopoeia and in 1811 was appointed professor of botany and materia medica at Brown University where he laid out the college's first botanical garden. He lectured at the University's first medical school between 1811 and 1827 when the medical school closed. He was one of the original members and vice-president of the Rhode Island Medical Society in 1812, American Academy of Arts and Sciences, and one of the founders of the Rhode Island Society for the Encouragement of Domestic Industry. With his son William Drowne, he cowrote in 1824 The Compendium of Agriculture, or the Farmer's Guide a thorough guide on husbandry and gardening. He was a well known speaker for his lectures on many topics, best known being his eulogy to George Washington and his “Oration in Aid of the Cause of the Greeks”. Drowne's papers are now a part of Brown University's collection. In his later life, Solomon Drowne acquired an estate next to the house in Foster, RI of his college friend Theodore Foster and had built “a house I can swing a cat in.” He named his estate Mount Hygeia after the Greek goddess of health. He had an extensive botanical garden with many exotic trees and plants, some of which he used in preparation of his own medicines. Here he pursued his love of medicine, agriculture, and literature. Sheila Lennon authored a nice summary piece in her Providence Journal "Time Lapse" blog, April 20, 2014 about Solomon Drowne and his estate on Mount Hygeia. Right: Solomon Drowne's house, built c1808, was on a large estate that included his botanical gardens. The house is still extant, was restored by 1975 and is listed as National Historical Landmark. He died in Foster, RI on 5February1834. His widow applied for a pension for his service in the Revolution as three years a a surgeon in Col. Crary's Regiment of RI Troops. signed and spelled her name Betsey Drown--no e at the end. DROWNE Solomon, surgeon, Col. Crary's regiment, 1776 ; pay due £100 1 3. DROWNE Solomon, surgeon's mate, Providence county, all $525.00, rec $1,530.04, R. I. Cont. Line, pl July 25, 1833, com March 4, 1831, age 81. While Solomon Drowne admittedly did not actually participate in the attack on the Gaspee, he did not tell authorities what he witnessed on that night. We therefore indict him for aiding and abetting these fugitives against King George III.